CANTON, Mass. – At the final whistle, there wasn’t the type of celebration you would expect from a team that just played its first playoff game in decades, not to mention its first ever playoff game in front of its home fans. There was a quiet, subdued feeling as the Canton players surrounded their coaches to talk about a 27-13 win against no. 5 seed Hanover on Friday night at WWII Veterans Memorial Field. 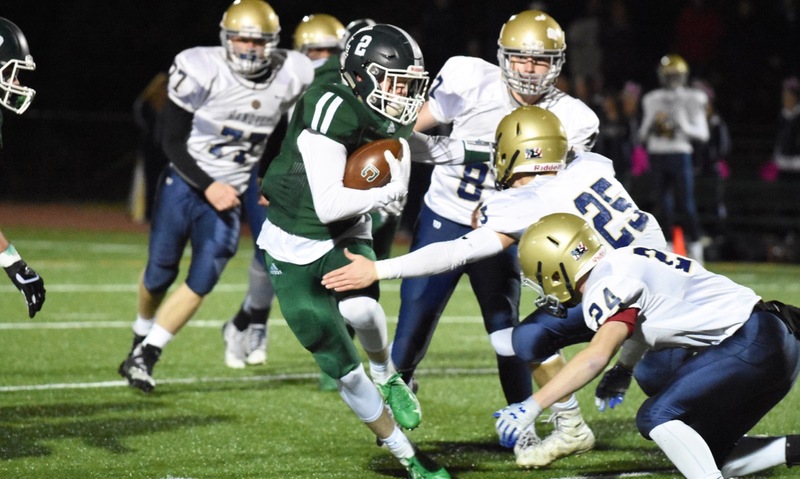 While penalties slowed the game down, and cut short a couple of potential scoring drives for the hosts, Canton showed its resiliency in the second half. 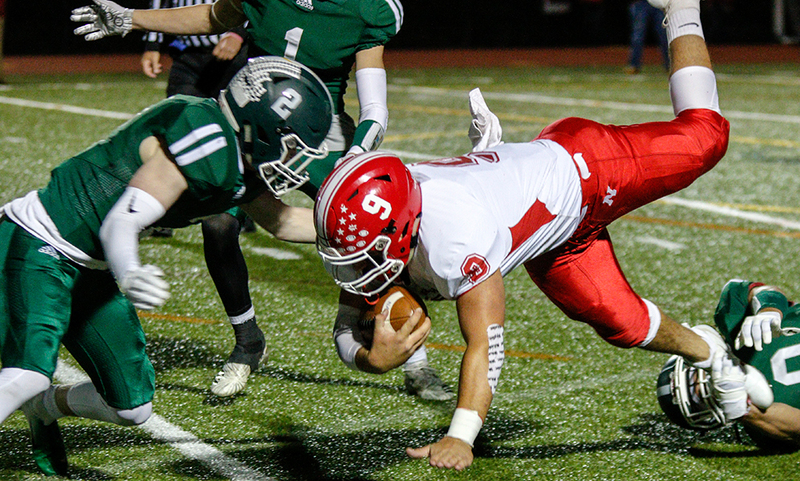 Hanover, which had struggled to sustain anything on offense, twice scored on big plays to cut the lead down to just a touchdown, but both times the Bulldogs answered with long possessions to extend the lead. Canton doesn’t have a lot of experience with the football playoffs, but the Bulldogs came out flying in the first quarter to jump in front by a couple scores. After stuffing the Indians on the opening kickoff, the Canton defense forced a three-and-out and took over at its own 48. 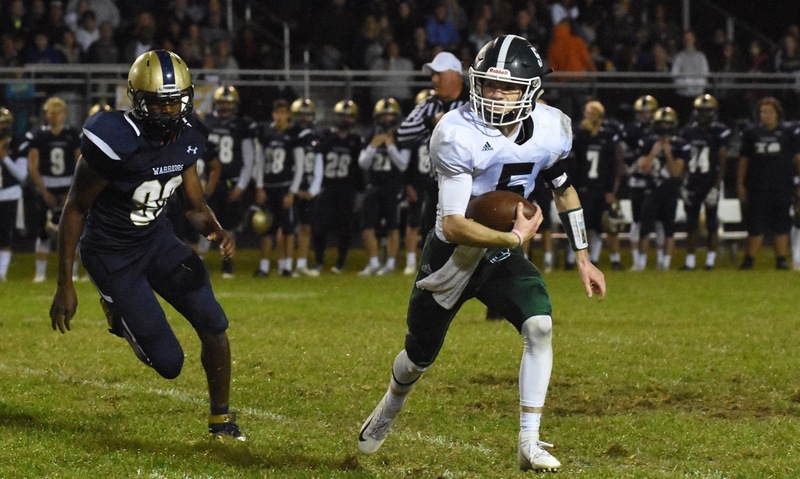 The offense went right to work with junior quarterback Johnny Hagan showing off his ability to make plays with his feet (15 carries, 87 yards) and his arm (7-of-17, 80 yards). He hit Gersom Rivera for a 23-yard completion on third down to get inside the five and then two plays later Brendan Albert punched it in from two yards out. The Bulldogs were trying to send a message and they forced another three-and-out from the Hanover offense. On fourth down, punter Jack Delahunt rolled out to the far sideline and tried to make it to the sticks only to be cut down a yard short. Canton got the ball at the Indians 24. Hagan got 16 yards on second and 17 and then Rivera gained nine over a pair of carries. Fitzgerald (19 carries, 143 yards) took it from there, finding a seam from five yards out for a 14-0 lead at the end of the first 11 minutes. The game really could have been over by halftime. 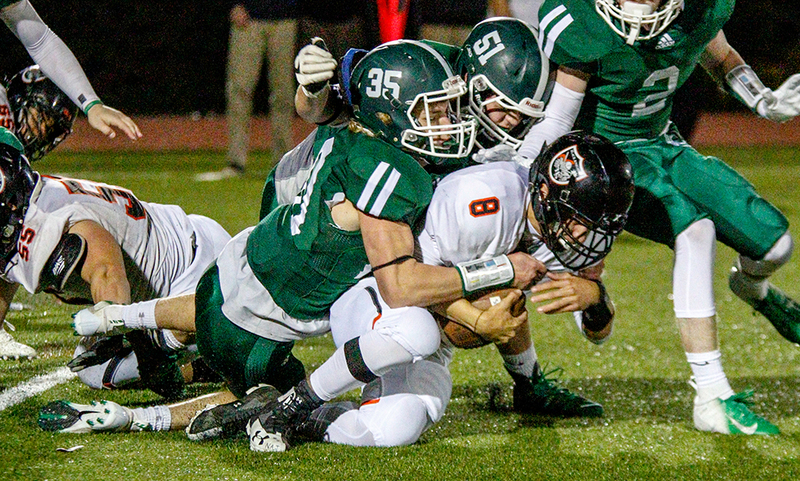 The defense continued to put pressure on Hanover quarterback Andrew Carroll, including a big pass rush from junior Jack Connolly and then a sack from Albert to get the ball back. Canton marched right back into Hanover territory, with Hagan converting a fourth down play with a four-yard keeper. Fitzgerald then had the highlight of the night on a sweep to the left for 32 yards in which he hurdled a Hanover defensive back before being brought down at the Indians six. On the next play, the Bulldogs fumbled a handoff and lost possession. After another defensive stand, the Bulldogs offense went on the move again. Fitzgerald had another big gain, this time for 35 yards, and Canton got as far as the Hanover 15 but then a holding call and a sack forced them back. A last-second pass to Rivera was tipped away and it was 14-0 at the break. On its first possession of the second half, Hanover stunned the Canton crowd (and sideline) by finally finding a big play on offense. Despite Albert getting into the backfield and hitting Carroll as he threw, the Indians signal caller was able to get the ball downfield to Drew Berard, who beat his coverage for a 60-yard score. The Bulldogs answered with a 17-play, 70-yard drive to regain the two-score advantage and eat up the final 8:44 of the third quarter. Hagan found Ryan Lentol on an eight-yard completion to convert a big third down and then Fitzgerald on a comeback route for nine yards on a fourth and eight. On third down, Hagan then connected with Jace Emma for a 13-yard score and a 20-7 lead. Hanover came right back with a even more shocking play. On fourth and one, the Bulldogs had Evan Ritchie caught in the backfield, but he slipped out of the grasp of a would-be tackler and bolted up the Hanover sideline for a 66-yard score. Rather than getting down, Canton just went back to work on offense, grinding out a 12-play, 72-yard, six-minute drive that sealed the win. Hagan gained 29 yards on a pair of keepers and had an 18-yard pass to Fitzgerald to get to the Hanover 20. 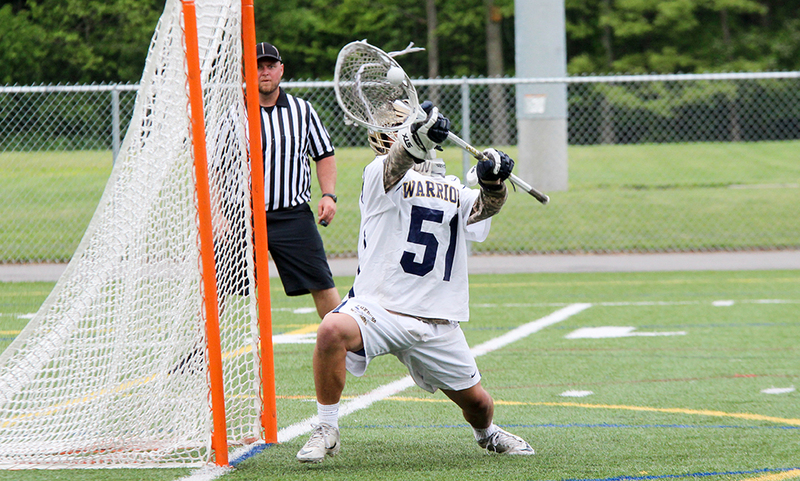 After Fitzgerald got the Bulldogs got the ball to the two, Hagan was denied on a pair of sneaks, so the Bulldogs went back to Fitzgerald for the one-yard score to seal the win with three minutes to play.